Kidsilk Creation is a limited edition yarn. 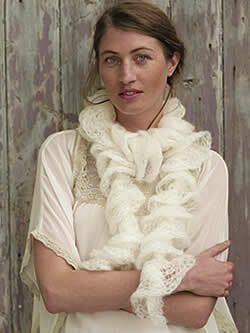 A net, tubular construction made from the best selling yarn Kidsilk Haze which is 70% super kidsilk mohair and 30% silk. The colors have been from the favorite shades of Kidsilk Haze cream, dewberry, trance, candy girl, jelly and smoke. Using a special technique one 50 gm hank will make a beautiful frilly scarf.